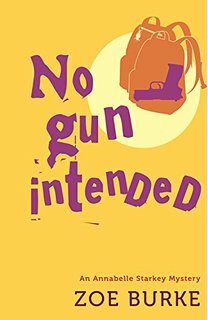 Details at the end of this post on how to win a copy of No Gun Intended, and a link to purchase it where a portion goes to help support KRL. After the traumatic events documented in Jump the Gun, Jeff and Sylvia Starkey decided to relocate and start anew in Portland, Oregon. Having recently moved to New York herself, their daughter Anabelle Starkey is on her first real visit to see her parents. Flying is never enjoyable, and everything goes downhill quickly when Anabelle not only gets wine spilled on her by a dozing passenger but her backpack is swapped out with another’s in baggage claim—and the backpack contains a gun. As a newly minted partner with the just-as-new Asta Investigations, Anabelle knows guns, and the one in her possession is definitely bad news. The Portland police are a little dubious about her story, so Anabelle doesn’t call them immediately when the woman now owning Anabelle’s backpack calls asking for help. Claudia is attacked and left in a coma before Anabelle can meet her, and since Anabelle is more of a dumpster-diving specialist than an actual detective, she’s grateful for the quick arrival of her friend, former Las Vegas police officer Luis Maldonado. Anabelle’s partner/boyfriend Mickey soon follows, and together with Anabelle’s enthusiastic parents, they track down the gun, who wanted to use it, and why someone needed to give it to Claudia. Young Anabelle is impetuous, prideful, and so loyal to those she loves that readers will immediately become engaged in the adventures of this novice investigator. Her brilliant parents are standouts themselves, and they adore and protect their only daughter. A Stanford University astrophysicist on sabbatical married to a foul-mouthed ER doctor fired for extremely vehement insubordination, the couple epitomize perfect love in Anabelle’s eyes. Imagining attaining the same with Mickey is as exhilarating for her as it is terrifying. Always quick with a wisecrack and not the best at taking criticism, Anabelle and her love of movie references ensure for a fast and always entertaining read. The exploration of relationships between parents and their adult children elevates this novel above most humorous mysteries, rewarding readers with an enjoyable read that induces as many warm feelings as it does laughter. To enter to win a copy of No Gun Intended, simply email KRL at krlcontests@gmail[dot]com by replacing the [dot] with a period, and with the subject line “gun,” or comment on this article. A winner will be chosen January 9, 2016. U.S. residents only. If entering via email please include your mailing address, and if via comment please include your email address. Looks like an interesting read. Would really enjoy. Sounds like a book to read and a series to be added to my TBR list. Thanks for sending me this notice! I’m excited to own a copy of this fun new series by Zoe Burke. Hope I win! What a great opportunity to read a book from an author I’m not familiar with.